i've just finished watching Season 2 of Downton Abbey (if you're a DA fangirl too, hit me up on twitter), so i can't help but be inspired by all the flowy Edwardian silhouettes as we head into spring. the diaphanous gowns and dresses warrant another post entirely, but the one foundation piece that is as fresh and modern now as it was then is the silk collared blouse. i'm not a super girly girl, but even i am rather inspired by the tweedy tailoring, airy dresses and gilded details. apparently so is Ralph Lauren. for the modern woman, the feminin silk blouse is more work-appropriate, while the slightly masculin silk button-down exudes an easy elegance for night or weekend. depending on your work and lifestyle, though, both can be equally versatile and timeless. a great silk blouse stands on its own as a classic, and also serves as a luxe blank canvas. you could pair it with a great costume necklace, keep it clean with minimal jewelry, add a pair of leather/leather-look skinny pants for some chic contrast, or just wear with blue jeans and your favorite shoes. the possibilities are quite effortless. Lovely post. I consider silk blouses to be foundation pieces as well. They're just so easy to wear and a blank canvas like you said. Your collection is wonderful. Unfortunately, Equipment's silk shirts are too big for me. I like my silk shirts loose and drapey, but my shoulders are too narrow for Equipment. I have a lot of trouble with all button down shirts because of my narrow shoulders, long arms and nonexistent chest. As an alternative, I had silk shirts custom made to my measurements in several neutral colors. I've been living in them. that's a great idea! my equipment shirts are a big large in the shoulders too, but i have broad-ish shoulders for my frame so it's not too much of an issue. i like the slouchy fit. The silk blouse looks great on you. I like the slouchy boyfriend style. I don't have any silk shirts--it's too precious living in a tropical climate. I realized that I still don't own that perfect white silk blouse so have been looking at the Equipment ones. Should I size down if I don't want it to be too too drapey? i think so - the XS that i'm wearing is still roomy and slouchy, and IMO a great silk blouse needs some drape to bring out the lovely texture of the silk. Love the equipment shirts, but I find them too long even in size XS :( I love both kind of shirts, I think it depends on the mood as well. I like pairing the more feminine blouses with a more "masculine" o-neck sweater. I love your Equipment silk blouses. I am considering investing in one (or two, hehe). Do you mind what size you wear? I know they are meant to be loose and oversized so I'm confused on what size to order. that is incredibly sweet - thank you! I'm still more of a cotton shirt girl than silk, but I've found my silk blouse to be a good option for evenings and dinners. I like silk shirts best when they're cut a little loose, but I hate it when they're too long. Contrary to some of the comments, I've actually found silk quite easy to care for - I put them in a wash bag and toss them into my machine (my mother's miele or my maytag machine) and use the "delicates" setting and a gentle detergent, and they've not degraded in any way over the past 2-3 years. It's way easier to maintain than knits. But silk is generally quite stifling on warm days, which is why I still prefer cotton. For colder climates, I found them incredibly insulating under a sweater - a great way to minimise bulk. i'm the same way! i don't mind the length on my equipment shirts - they're not *too* long for me and go well with skinny pants and heels. if i had my own quality washing machine back home i'd definitely dry clean my silk blouses less. i find silk to be ideal for a *certain* kind of warm day - if it's not too humid. when it gets really nasty hot out, i like cotton or cotton-silk blends. I'm not really a shirt person, but I'd love to add a couple of silk shirts/blouses to my wardrobe. Cotton shirts are usually to stiff for my curvy figure, whereas silk will drape softly. i agree! silk is such a special fabric - it completely changes how you move and feel when you're wearing it. I nerver try silk blouse, i'm a cotton blouse girl :) In fact, i don't really like the way silk drape on my body, too slouchy. I prefer the mix cotton - silk, it's easier to clean. 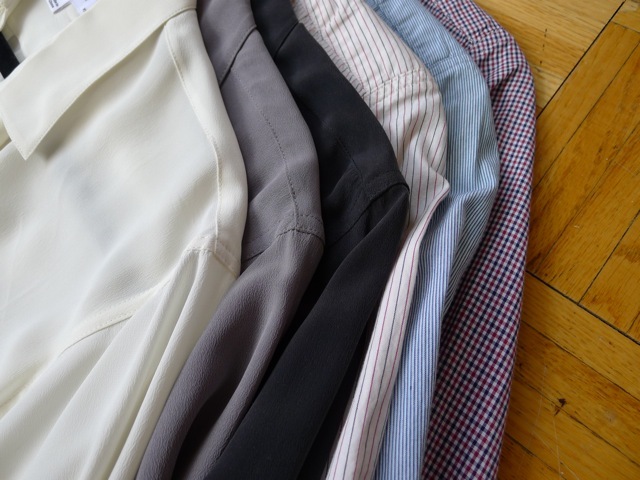 i have a few silk cotton shirts too that i love - it's such a classic blend! perfect for hot days. i don't have a silk blouse but it looks like a great staple to have. i like that it can be dressed up or down - seems very versatile. also, i prefer longer shirts due to my long torso, so that is also a plus. i love wearing my equipment blouses untucked, so i don't mind the longer length either! I've been looking to buy a silk blouse, but I haven't found the ONE yet. I love how effortlessly glamorous it looks, even in a masculine cut. I do worry about how it'll feel in a tropical setting. Silk isn't the most practical fabric to wear when it's hot and humid, which it almost always is wear I live. And, gaaaaaaah. 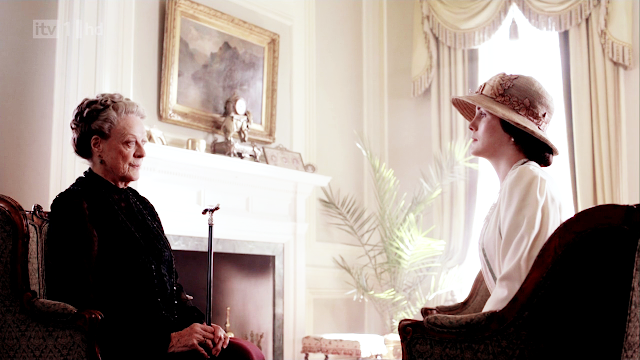 I NEED to start watching Downton Abbey ASAP. it was such a treat to discover DA last week. i went through seasons 1 & 2 over the weekend. soooo good! I have only recently dared to trust myself with silk! I am especially drawn to the polkadot versions, and have my eye on one from Jigsaw. And I am so relieved to be able to look forward to wearing thinner blouses now that spring is on the way. So refreshing, and most welcome. 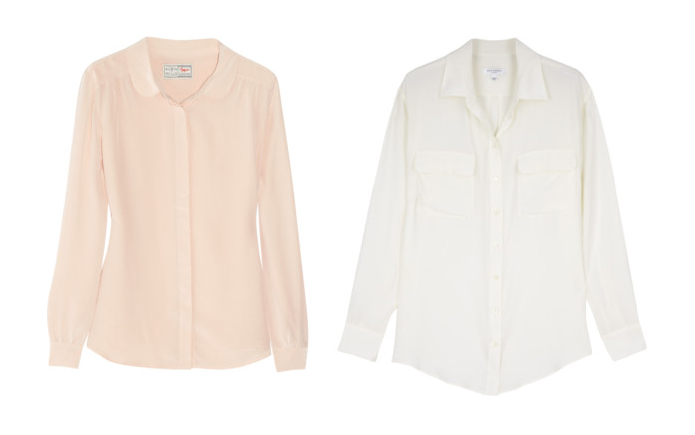 I like the peach coloured shirt above (aubin&wills? ), which of course is sold out in my size all over the web. And I am not familiar with Downton Abbey! Is it American? I tend to avoid tv these days, so am a bit out of the loop, but I keep noticing the adoration on tumblr! 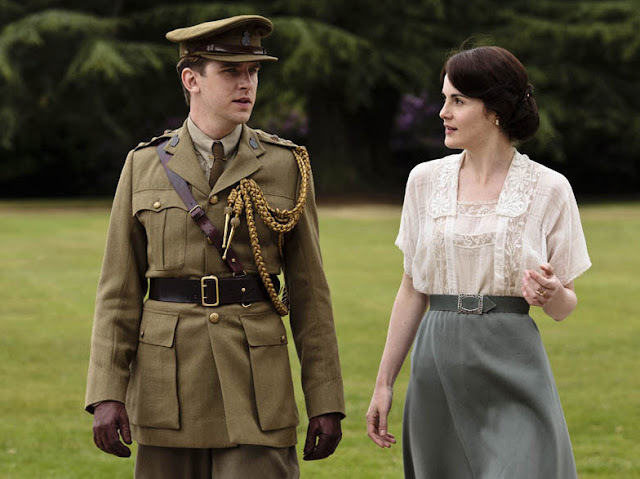 DA is an incredibly addictively good show from England. you need to watch it! i think silk (esp good quality) is less delicate than you think. i don't have any silk blouses that are more 'feminine' so i'm very tempted by the a&w one! I love silk blouses but hate how easily they wrinkle when you wear them in the heat of the day. I like them in a masculine cut but feminine colors such as my blush madewell. I love shirts and was looking at an equipment shirt today. They are expensive but seem to be good quality. How have your aged? Have you had them for a while. I am obsessed with DA. the fashion is incredible I particularly love the long skirt/blouse look. I can watch it on repeat! Best show in a long time :) Really enjoying you foundations series btw!